The Greek capital is one of the most exciting cities in the world to live in right now, as any member of its growing expat community will confirm. Indeed, since the onset of the economic downturn, thousands of Greeks have left for better career opportunities elsewhere and the country was recently ranked the worst place to live by the InterNations Expat Insider survey – in large part because of the tough financial conditions. Yet speak with anyone in the city’s lively expat community and you’ll hear not only a hundred reasons why the survey’s gloomy assessment is totally wrong, but a hundred more why Athens is one of the most exciting cities in the world right now. 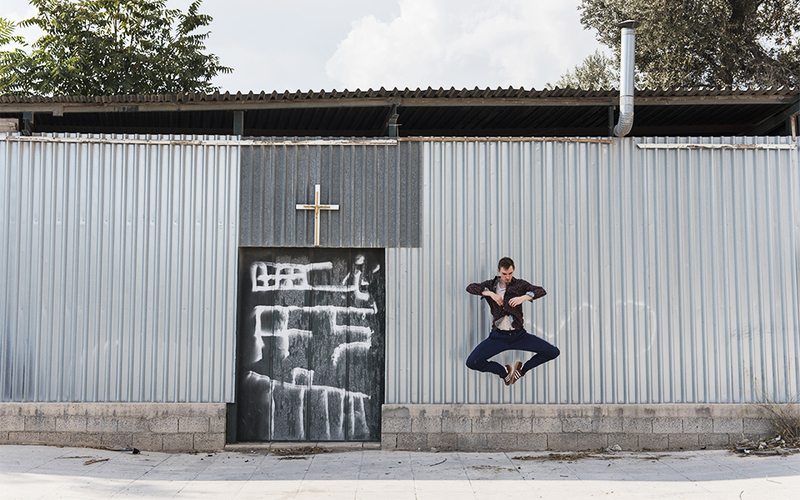 Athens is increasingly seen as a city of possibilities, and foreigners, particularly young creatives, are moving here to enjoy the remarkable quality of life. “Athens is the new Berlin” has become a somewhat tired phrase, but it does celebrate real parallels between the cultural renaissance we’re witnessing today and the creative boom that transformed the German capital’s identity in the 1990s and early 2000s, catalyzed by a wealth of affordable space. But Athens walks its own path, and cheap rent is a relatively minor factor in its powerful resurgence. While the low cost of living provides financial breathing space for start-ups and passion projects (now next to impossible in cities like Paris, London and New York), it is the vibrant multicultural climate and globally connected buzz that keep the fires of inspiration lit. 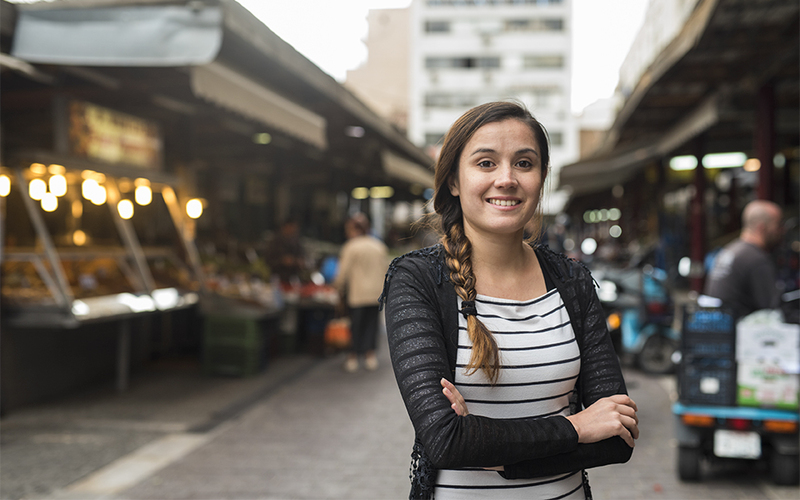 Each of our interviewees found something in Athens they couldn’t find anywhere else, but the ultimate endorsement for the Greek capital comes from their proud assertions that they have no plans to leave; their futures are firmly invested in Athens. Michael was intrigued by Athens’ technicolor mix of East and West. So he auditioned for the National Opera, was hired as a member of the corps de ballet in September 2012, and promoted to demi-soloist in 2014. Over the last five years, Michael has toured Greece with the company in acclaimed productions such as “Topia” and “Zorba the Greek” and has evolved immensely as a dancer. But the experience of living and working in such a cultural melting pot inspired him to take the next step: in July 2017, he quit to go freelance, setting out in a new direction that integrates his classical schooling and contemporary inspirations. The best place to watch dance is… the breakdance crew in the square opposite Thiseio metro station. I always watch them and I have a lot of respect for what they do. The best place to eat… Avli, which has great food and is super cheap. I love places in Athens that don’t feel like Athens and at Avli you feel like you could be on one of the islands. My hidden gem… I love climbing to the top of the Panathenaic Stadium from the park behind it, so I can sit and admire the spectacular view of the Kallimarmaro and the city. Before I moved here I wish I’d known… that the Greeks are not European, they’re closer to the eastern folk. It took me a while to work out that they’re not like us Northern Europeans. You’re an Athenian when you… understand the appropriate amount of time your body needs to digest a frappé, so you drink it slowly and not like a complete amateur. Ilse is lounging on the balcony of her palatial studio space in Exarchia, which overlooks the Athens Polytechnic and Strefi Hill. She explains how, when she first came to Athens in 2015 for a class project on Greek tourism while studying at Design Academy Eindhoven, she was fascinated by the city’s old bookshops and printworks. In one of these she met the bookbinder Yiannis Evangelidis, who inspired her to create a bridge between Greek craftspeople and the Dutch design community. It’s been a busy year for Ilse. Two weeks after her graduation, she moved to Athens, and co-founded Publikators publishing agency with Dutch writer Anna van den Berg. She also designed the graphic identity for Syntagma’s new restaurant 3.33 and is creating an atelier space with French designer Roxanne Brennen, due to open shortly. But Ilse is most proud of Book for Sale, a print publication and online platform that connects Athens-based artisans to the global marketplace. My favorite place to see art is… on the streets, where the pure freedom is. You know you’re an Athenian when you… fit 10,000 things into one day: coffee with friends, walking the dog and making some art, too, and still wonder how you manage to do it. Take a client to… Little Tree Books and Coffee. It’s a beautiful bookshop near the Acropolis Museum and a great place to just sit and talk over a cup of fine coffee. Take a date to… Drupes & Drips, which is cozy inside and has lovely wines. It’s in a great area to go for a walk after your cheese and drinks. My best-kept secret is… the restaurant Saligaros in Exarchia, where locals with really intense lives gather to have fun and share really, really good food. To get inspired… go up Strefi Hill with a book or some drawing materials. As you climb, the street noise slowly disappears and you literally gain a new perspective on the city. When your world feels small, here is a place you can go to make it big again. Matthieu Prat doesn’t feel like an expat. To be an expat, he argues, you have to have powerful bonds tying you to your mother culture and a strong sense of where “home” is. But Matthieu has no simple answer to the question, “Where are you from?” He was born in Paris and has barely stopped moving ever since. Growing up, he lived first in a number of French cities before going on to stay in Monaco, London, Geneva and Casablanca; he spent most of his formative teenage years in Morocco. So after working in Istanbul and Paris, why here? 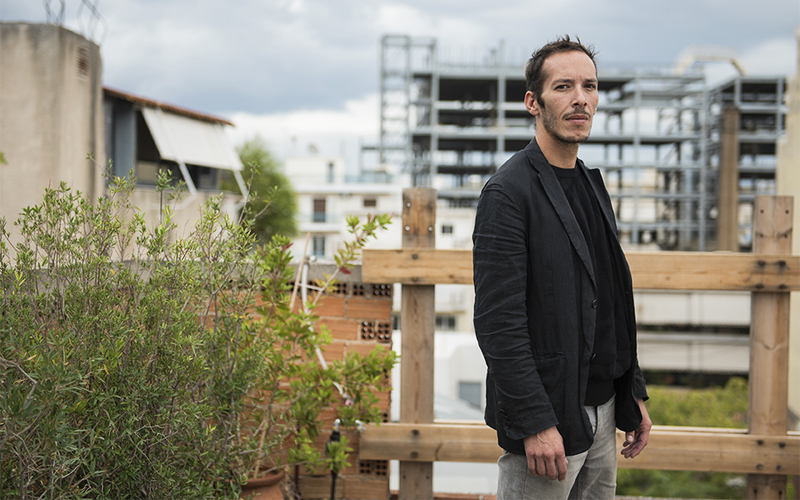 It’s simple: “You can do better work from Athens.” Matthieu relocated his experimental art/architecture studio Diplomates to Athens in 2015 after feeling stifled in France. 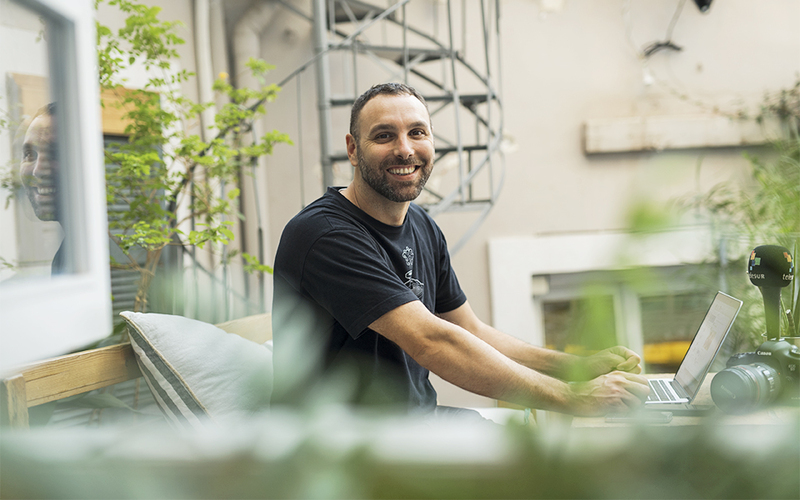 Today, he works from an unfinished concrete shell of a building in Votanikos, where he launched Kassandras, an “urban and social laboratory” that explores the intersection between architecture and activism. My favorite place to discover art is… Locus Athens, which curates exhibitions without running a gallery, yet each of their projects reveals a new space and great art. Back in France I would never be able to… experiment and innovate within cultural, social and urban fields. I go to unwind in… Tritsis Park. It’s a little-known paradise, full of a variety of landscapes and where Organization Earth runs an experimental farm. What frustrates me most about Athens is… the excessive bureaucracy and its resistance to facilitating development initiatives. What inspires me most about Athens is… its abnormality. It’s still a territory for individual and collective possibilities, where questions about the cities of tomorrow can be investigated. The best way to discover music is… browsing for vinyl at the weekend flea market and in the thrift shops near Thiseio metro station. You can find funk, house and lots of old disco tunes so cheap that it’s almost theft. My favorite place for a drink is… The Clumsies, which is a world-renowned and really original cocktail bar near Klafthmonos Square. Take a client… for a drink at the Galaxy Bar on top of the Hilton. It has amazing views of Athens and of Lycabettus Hill. For a feast… head to Moorings in Vouliagmeni. It’s a lovely, peaceful setting there, and you can look out over the water. A perfect day for Ruby Mateja starts with a coffee on her balcony in Exarchia and a walk around the local area to check out its many eclectic bookstores and record shops. On Wednesday afternoons, you’ll find her in the nearby Aghiou Nikolaou Park teaching skateboarding against a typically Athenian backdrop of crumbling concrete and graffiti. Ruby’s students are young refugees from the nearby Khora community center, and this is one of the daily skate lessons her Free Movement Skateboarding project offers to 150 marginalized young people – about half of whom are girls – around Athens each week. “Skateboarding opened up a whole world to me,” Ruby explains. “Traveling to Palestine in October 2016 to volunteer with the skate-for-development charity SkatePal was just everything I wanted to be doing. Free Movement Skateboarding co-founder Will Ascott and I saw the massive positive impact of the skatepark they had built, not just on the kids but on the whole community.” Will suggested Athens would be the perfect place to launch a project of their own so, in March 2017, they began work on a mobile skatepark that fits into the back of a van, and the rest is history. Best spot for a bite is… the falafel man who sets up most nights in Exarchia Square. He blasts galactic techno music while making his delicious falafel wraps. What more could you want? My most “Greek” habit is… drinking freddo espressos all day long and being late for everything. My favorite Greek word is… not fit to print, but I love shouting opa! when someone falls off their board. The best skate spot is… Galatsi Park. But I would recommend ripping around the roads late at night, stopping at different spots and meeting the locals. Catch the sunset… on Strefi Hill. Lycabettus gets all the tourists, but at Strefi you’ll just be hanging out with locals. Hibai left his job as a human rights lawyer and moved to Athens with his Greek partner in July 2014, where he began a new career as a journalist. Greece’s turbulent economic and political climate has given him ample material to fuel this transition. As foreign correspondent for Telesur, a major Latin American TV network, he has reported on one of the most dramatic periods in modern European history including the ongoing refugee crisis, popular mobilizations against austerity, and the rise of Syriza and its dramatic clash with the troika of bailout lenders. “Athens still has an authenticity to it, there’s always something surprising happening here,” he says. “I really like this mix of Mediterranean life, Balkan style and eastern influences.” Chronicling Athens’ many ups and downs might not be a quiet life, but Hibai is here to stay. His first son was born this year, who, with his mixed Greek and Spanish heritage, will be another bright stroke of color on Athens’ rich, multicultural canvas. To get inspired… I take a walk around Neos Kosmos, my neighborhood, without any direction in mind and get to know the streets. I love to sit and talk with the mix of Athenians and migrants who make up the area. Take a client to… Koutoukaki in Koukaki because it’s the absolute opposite of a Barcelonian bar: it’s not fancy and there’s almost no information on the outside but the food and the people are fantastic. Before I moved here I wish I knew… more about the modern history of Athens. Everyone focuses on ancient Greece, but the last 100-150 years are really interesting: winning independence from the Ottoman Empire, the Nazi occupation, civil war, dictatorship and resistance to austerity and neoliberalism. Best place to catch the sunrise… if you’re strong enough to dance all night, sitting on Filopappou Hill as the sun comes up is the best end to a good night out. Best way to escape the city… is to take a boat to one of the Cycladic islands, but I’d rather keep the name of my favorite island secret. Stephanie Martinez remembers watching the heart-wrenching footage of families arriving on Lesvos in flimsy dinghies from Turkey in the summer of 2015. The Greek island beaches that became focus points of the global refugee crisis felt worlds away from her life in Santiago, but Stephanie knew she had to do something. “I couldn’t stay in the comfort of my home and go on with my regular work while I knew what was happening,” she says. Like thousands of Greek and international volunteers, Stephanie arrived on Lesvos that year to help ease the difficult situation refugees encountered as they arrived in their hundreds of thousands. But as the epicenter of the crisis shifted from the islands to supporting the refugees now resident in Greece, she followed the human flow to Ioannina in northwestern Greece, where she opened the Habibi Centre, an educational space for refugee youths, before relocating to Athens in February 2017. The Habibi Centre made headlines by offering students the opportunity to learn science, math and English via an online platform, but Stephanie still teaches English face-to-face to 25 students and helps them prepare for their futures. Each morning, when the school near Omonia Square opens, you can find her surrounded by excited kids, proudly showing off the English phrases she has taught them. Take your friends to … AthenStyle, a bar near Monastiraki with an incredible view of the Acropolis. The atmosphere is lively and the staff are really friendly. My favorite place to eat is… Pyroliki, a Cretan restaurant hidden in Kerameikos. It has delicious food and much more reasonable prices than you would find in Monastiraki. I would take a Greek to… Mystic Pizza in Exarchia. Many Greeks avoid Exarchia but it’s worth the stroll for an amazing slice! To switch off… take a walk in the National Gardens. It’s so tranquil, you can escape the crowds and noise of the cars by getting lost in the greenery. My most “Greek” habit is… Saying ochi (no) and den gnorizo (I don’t know) without using words. There is just something about the body language that I love. The best place to listen to music is… whenever I hear traditional Greek music coming from inside a taverna or a street musician, I always have to stop and listen, especially when it’s Zorba the Greek.